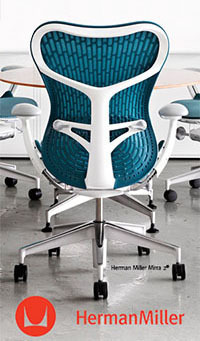 Herman Miller Eames Desk Unit - Authorized Retailer and Warranty Service Center - Eames Desk Unit by Herman Miller, Aeron, Mirra, Embody, Celle, Eames Home Office Ergonomic chair. Product Story - Long before "modularity" and "high tech" entered the design lexicon, Charles and Ray Eames were using industrial production techniques to extend the boundaries of design and create a modern aesthetic. These desk and storage units complement each other, and each can stand alone. They provide ample storage, work, and display space. And at home or in the office, they look as striking now as they did when first introduced in 1950. Design Story - The Eames desk unit and Eames storage unit are emblematic of the grace and vision Charles and Ray Eames used in solving home furnishing problems. A result of work they had done for a 1949 exhibition at the Detroit Institute of Arts, the desk and storage units reveal the "machine aesthetic" and Japanese influences important to the Eameses at the time. The wire cross supports used in the desk and storage units echo other classic Eames designs, including Eames wire chairs and wire-base tables. The resulting products are practical and ideal for a home office. They retain their modern look with a dash of retro styling. Practical Functionality - Desk and storage units are available in sizes that meet your storage and display needs. Storage units include cases, cabinets, and drawers in five configurations and four sizes; desks can have the drawer on the right or left side. Desks are 60 inches wide, 28 inches deep, 29 inches high; storage units are 47 inches wide, 16 inches deep, and 20 1/2, 32 1/2, or 58 1/2 inches high. The desk unit features an easily accessible storage or display area and has a handy drawer that accommodates hanging file folders. Fun - Have as much fun as you want. Desk and storage units come in two color schemes-neutral or bright. The neutral scheme uses birch veneer with white and black accents to create a sleek, high-tech look. The bright scheme uses red, blue, black, and white hardboard panels and surfaces reminiscent of a Mondrian painting. The steel cross-supports and uprights give the units an industrial feel, and the dimpled plywood on cabinet fronts and plywood drawer fronts and shelves reinforce the furniture's mid-century modern appearance. Strong - Uprights, cross-supports, and perforated panels are zinc-coated steel; drawer fronts and shelves are smooth plywood; side panels are painted hardboard; storage unit cabinet fronts are plywood molded to form round dimples. Nylon foot glides are easy on floors.